Tesoro Technology (not to be confused with the Tesoro oil corporation) is a young manufacturer of advanced PC peripherals. Despite that the company barely is five years old and that they are solely focused on peripherals alone, Tesoro has developed a very impressive lineup of products that consists of over a dozen keyboards, seven mice, headsets and several other products at the time of this review. 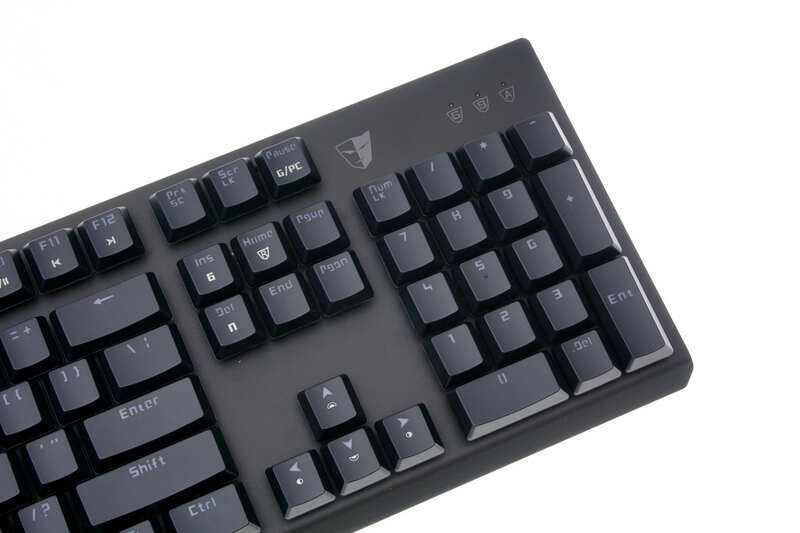 Our first Tesoro keyboard review was over a year ago with the Lobera Supreme, an expensive product with an aggressive appearance, and today we're taking a look at something a little different - and a little lower - than the Lobera. To that end, in today's review we are having a look at the Gram Spectrum, a gaming keyboard with RGB lighting and a new “gaming” switch from Kailh that was developed as an answer to Cherry’s Rapidfire switch. It also comes with other interesting unique features, such as low-profile keycaps, all of which we will examine in this review. 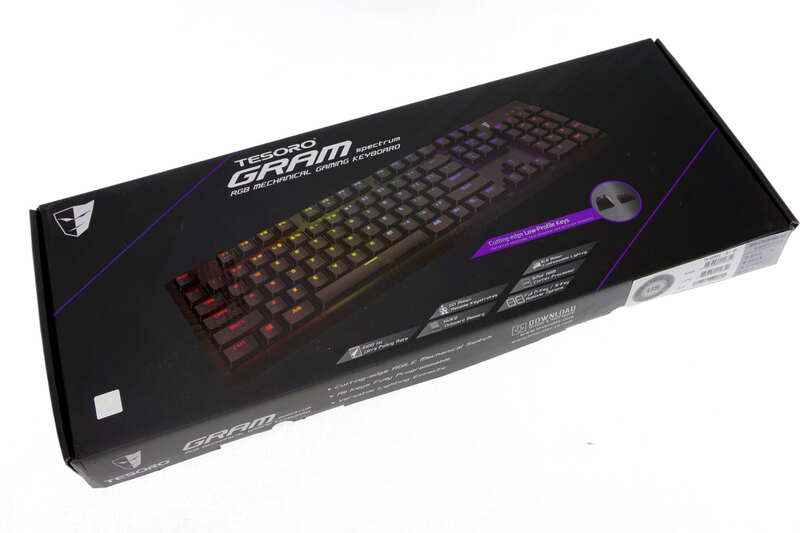 Tesoro supplies the Gram Spectrum in a standard cardboard box with the artwork focused on pictures of the keyboard itself. The packaging is simple but sturdy and secure enough for the safe shipping of the keyboard. 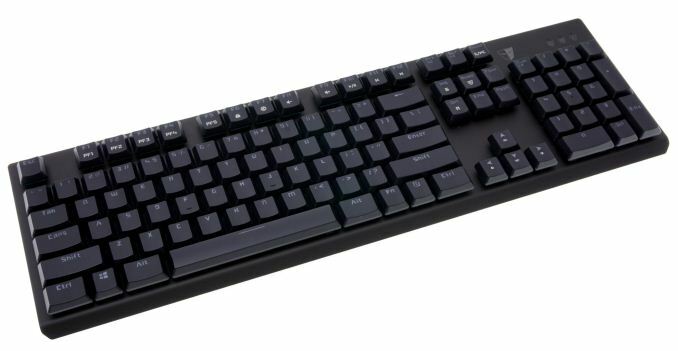 Tesoro is trying to promote the low-profile keycaps and shorter key travel distance as the major features of this model. With the exception of a simple quick-start leaflet, we found no items bundled with the keyboard inside the box. Tesoro has the habit of naming their products after famous historical and mythical swords, with Gram being the mythical sword of the Norse dragon-slaying hero Sigurd. That name may be a poor match for this keyboard, as the mythical sword is supposed to be sparkly and extravagant, whereas the keyboard is clearly based on a minimalistic design, with plain surfaces and simple straight lines. The top surface of the keyboard is metallic and largely responsible for the high mechanical strength of the keyboard. But even with its simple design, the Gram Spectrum is relatively heavy and feels very robust. 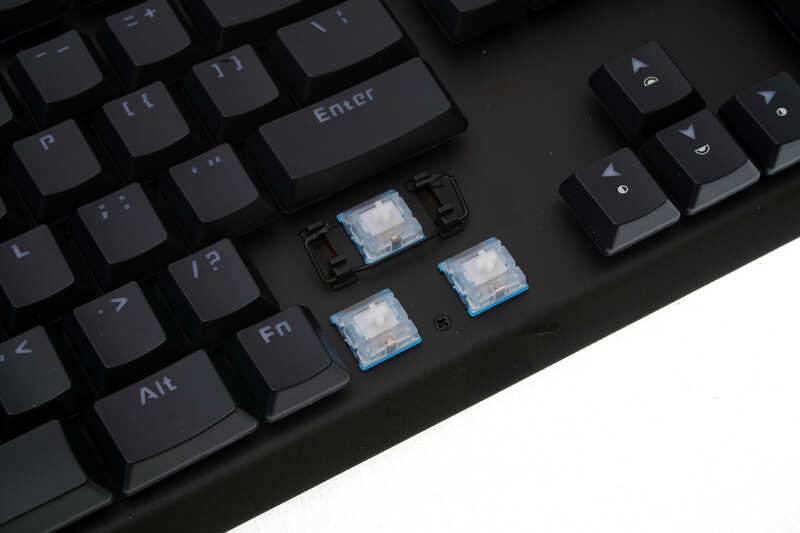 From a purely practical point of view, the keyboard is extremely easy to clean, as a simple blow can remove most debris from the flat surface of the keyboard. The cable of the keyboard is detachable, which does create the risk of damage at the connector but is also is very convenient for frequent transportation. The Gram Spectrum is a standard 104 keys keyboard, however it does not fully adhere to the ANSI layout. The bottom row of the keyboard has a 6.0× Spacebar, two 1.5× ALT, two 1.5× CTRL and three 1× WIN/Menu bottom row keys. The standard ANSI layout on the other hand calls for a 6.25× Spacebar and seven 1.25× bottom row keys. This does not really matter though because, as we will be describing in more detail soon, the keycaps cannot be replaced with aftermarket products anyway. The keycaps are made from ABS plastic and have medium-sized, sharp characters printed on them. Both the main and the secondary character is printed at the top of the keycap, so as to be equally illuminated by the LED of each switch. There are no extra buttons, knobs or switches on the Tesoro Gram Spectrum. However, some special functions can be accessed via special keystroke combinations. 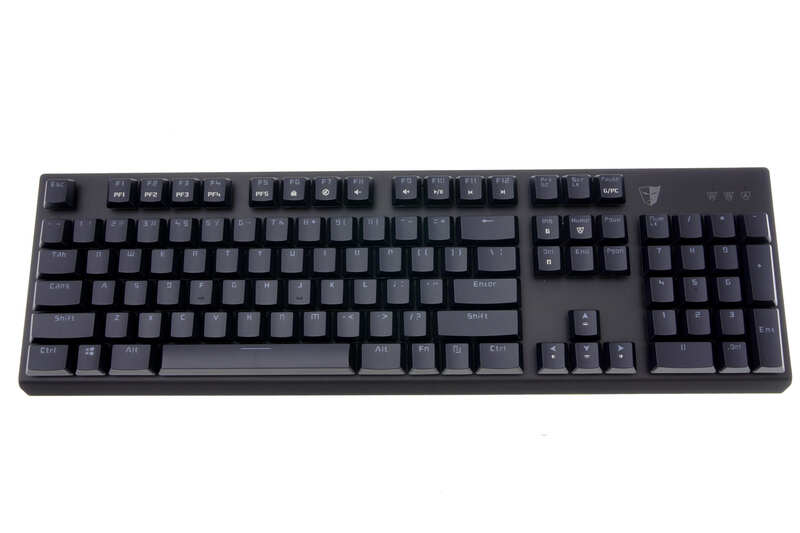 For example, by holding down the Fn key, the F1-F6 keys allow for on-the-fly programmed profile selection, the F7-F12 keys offer basic media and sound volume controls, and the arrow keys allow for basic illumination adjustments. Basic settings, such as the polling rate and Windows key lock, can also be accessed via combined keystrokes, but more advanced functions need to be performed via the keyboard’s software. Beneath the keycaps we found Kailh’s new Agile switches. Tesoro is marketing them as their own design, so I expect that these switches will be exclusive to Tesoro for a bit (probably for at least a year). Just from a quick look at their specifications, it is very clear that the company designed these as a direct competitor to Cherry’s Rapidfire switch. The travel and actuation distances of the Agile switch has been shortened by 0.5 mm, providing “quicker response time” to advanced gamers. In terms of mechanical design and feel, the Agile switch is very similar to Kaith's standard Blue switch, providing audible tactile feedback. This was a strange selection on behalf of Tesoro, as such switches are usually preferred by professionals, not gamers. The new switches also have a semi-transparent body for better lighting distribution and white stems. Stabilizers can be found beneath the larger keys, properly greased. Metal stabilizers are not as effective as cross-type stabilizers and make the removal of the keycaps a little more tedious, but we strongly recommend against unnecessarily removing the keycaps anyway, as the stem of the switch came off alongside with the keycap several times during our attempt to dismantle the keyboard. The stem and spring can be pushed back into place but it is highly unlikely that the switches will survive repeated attempts of this process. The Gram Spectrum can be easily mistaken for a typical electronic keyboard because of its keycaps, which are very short, less than half the height of a standard keycap. This initially looks as an attempt to improve the aesthetics of the keyboard, as the travel distance of the switch is unrelated to the size of the keycap. Further investigation however reveals that Kailh reduced the travel/actuation distance of the switches by shortening the stem of the switch, most likely to avoid legal issues with Cherry’s patent. Other keycaps can still be used on the Gram Spectrum but, as the stem is shorter, a normal keycap will actually bump against the surface of the keyboard before the switch bottoms down. The removal of the keyboard’s plastic bottom reveals a clean PCB permanently joined with the metallic top of the keyboard. The soldering job and overall quality of the assembly is textbook, without any flaws to be found. 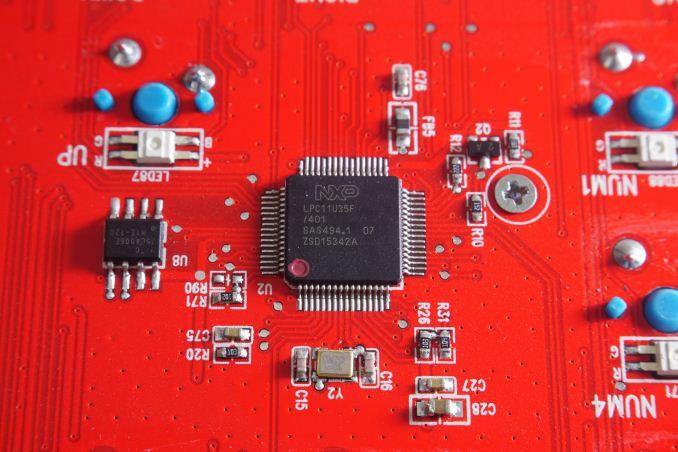 An NXP LPC11U35F-401 microcontroller is the heart of the Gram Spectrum. It has an ARM Cortex-M0 processor with a maximum frequency of 50 MHz, 64 kB Flash memory, 4 kB EEPROM and 10 kB SRAM. 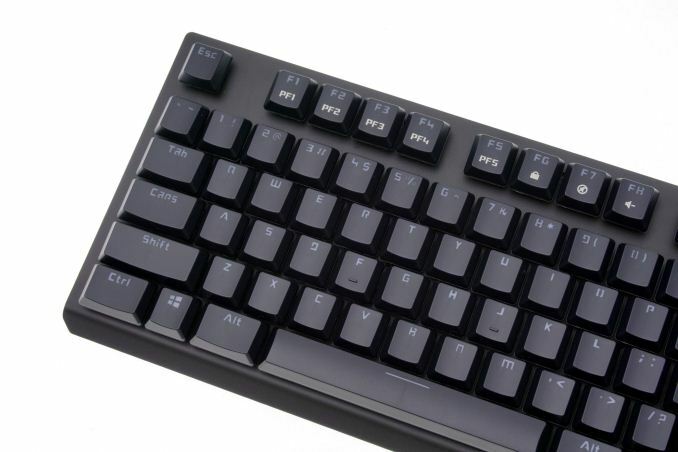 It is a high quality, proven solution for advanced mechanical keyboards. A memory chip from Macronix (25L4006E) is installed next to the processor, providing an additional 4Mbit (512KB) of onboard memory. I really dislike Corsair mechanical keyboards due to their nonstandard key layout on the bottom row, where they make the Ctrl and Alt keys larger, and the Windows and Command/Function keys smaller. I do like purchasing novelty keycap sets to replace the default keycaps after some time to get new look, and often enough the stock keycaps included are made with incredibly brittle keycaps that just break after time. I do prefer the Logitech G610, personally. It has a standard keycap layout, authentic Cherry MX Brown switches, moves extra functionality to its own dedicated keys (rather than a function key + another key shenanigans that many keyboards like to do), inoffensive logos/branding (just that simple Logitech G logo for their gaming products at the top left), keyboard macros (if you're into that) by remapping seldomly used F-keys during games, a high key rollover via USB, etc. "I really dislike Corsair mechanical keyboards due to their nonstandard key layout on the bottom row, where they make the Ctrl and Alt keys larger, and the Windows and Command/Function keys smaller." I'll agree that it's not the ANSI standard layout, but since Razer and CM Storm also use the same layout (CM Storm only on some products) one could argue that it's a de facto standard. De facto standards of course depend on adoption, but Corsair and Razer are pretty much 2/3 of the reason mechanical keyboards are available at mainstream retailers. That said of course I am disappointed as a K95 RGB owner that most keysets are unavailable to me, but then again from what I've seen most are anyways because I like my backlighting and want to keep it useful. Replacement keysets with properly backlight-compatible translucent legends on opaque (or at least much darker) keys are all but nonexistent. The majority of "backlight compatible" sets are fully translucent or even transparent keys. This can look good in some cases but it a lot less useful at providing a readable legend in a darkened environment. 1) It's not a defacto standard. ANSI is a standard. ISO is a standard. Corsair's layout is a more "gamer-friendly" standard that shrinks windows keys to make it less likely for users to press the Windows key during games (which often minimizes the game and brings up the Windows home menu), and makes the Ctrl and Alt keys bigger, which are common keys that are bound to actions in-game. However, by doing this (instead of opting for a a switch on the board that can toggle whether to register Windows key presses or not), the keyboard is automatically not compatible with the vast majority of ANSI compatible Cherry MX stem keyboards. 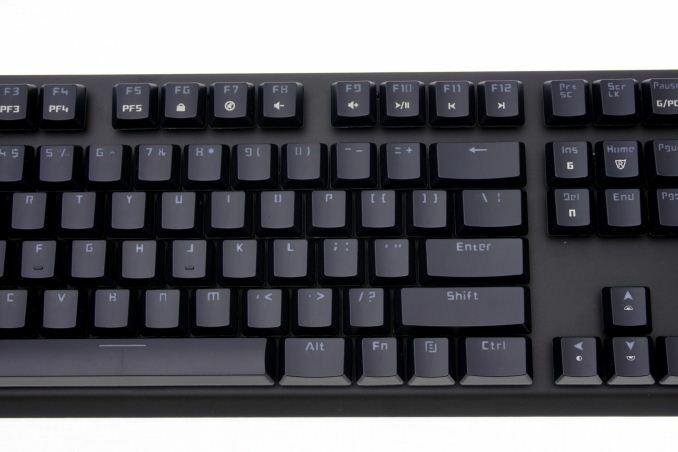 (Note, there are other ANSI keyboards that don't use Cherry MX switches, but have Cherry MX stems for use with standard ANSI layout Cherry MX stem keycap sets, such as the CoolerMaster Nova Touch). 2) Backlit compatible keycap sets do exist, but are indeed rarer than non backlit compatible keycap sets. However, backlit compatible keycap sets regularly are available on Massdrop every few weeks, and there's actually a drop right now for such a set: https://www.massdrop.com/buy/backlit-doubleshot-pb... That being said, from an ergonomics standpoint, I do vastly prefer to have an overhead lamp lighting my work area at night. Additionally, I've learned to touch type years ago and I actually prefer to have keycap sets without legends. I've found that legends add another layer of potential failure for keycaps, as pad printing wears off, doubleshot keycaps are (uncommonly) brittle when they use a brittle plastic for the legend, etc. Solid color keycaps never change except for the texture over time, which will smoothen out over time. I have a Rosewill one with brown keys. Build quality was fine except the connector wasn't held down by much more than solder so that's a potential weak point. You may ask, but my answer would not be helpful to you. The keyboard is a device that needs to meet someone's specific needs and my personal needs are unlikely to be the same as yours. Aesthetics aside, you need to ascertain whether you want a) lighting, b) per-key programmability and c) extra macro keys, volume control knobs, etc. I got the Thermaltake Meka G1 a few years ago and I still love it. Cherry MX Black keys with red LED backlighting. It was $89 on sale when I got it, but I don't know if they still make it. I've got around 17 different mechanical keyboards. This is the one I find myself always going back too and I couldn't tell you why.